It's Simple to order more than one pack of the same kind. When you click on the order button just enter the quantity you would like. 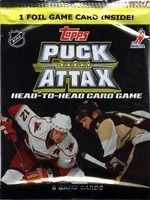 Buying hockey cards or other sports cards by the pack is the way most of us started collecting sports cards and is still the most fun way to collect today. There is always a thrill in opening a pack of hockey cards and finding that autograph card, special insert card or favorite player.